Last week I threw a ruby tiara from the French crown jewels in as a possibility for the ruby category of your ultimate tiara collection. It drew quite a bit of interest, so let's elaborate - starting with the Duchess of Angoulême. She was Queen of France for only 20 minutes in her lifetime, but she stamped her influence on the French crown jewels nevertheless. Marie Thérèse of France (1778-1851) was the oldest and only surviving child of King Louis XVI and Queen Marie Antoinette. While in exile following the French Revolution, she married her cousin, Louis Antoine, the Duke of Angoulême, and became known as the Duchess of Angoulême. 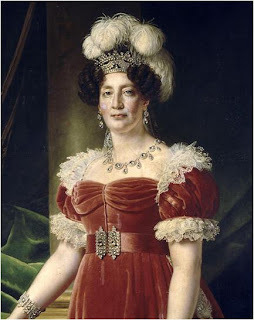 When the Bourbons were returned to the throne (in 1814, and then again in 1815), Marie Therese's widowed and childless uncle Louis XVIII reigned; in 1824, he was succeeded by her father-in-law Charles X, who was also widowed by that time. Marie Thérèse the first lady of the family, and thus the prime user of these luxurious jewels. 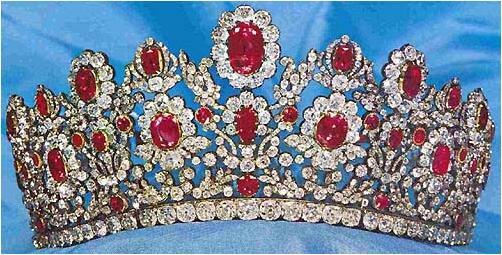 Replicas of the tiara and crown from the original French crown ruby parure - made of garnets and white sapphires. When Marie Thérèse returned to France, the crown jewels (which, in France and other countries, are not necessarily just coronation regalia) included a ruby and diamond parure made in 1811 by Maison Nitot for Empress Marie Louise (1791-1847), the second wife of Napoleon I. This was an extensive parure, including items you'd expect to see in a parure - a tiara, necklace, earrings, bracelets - but also items such as a crown and a belt. 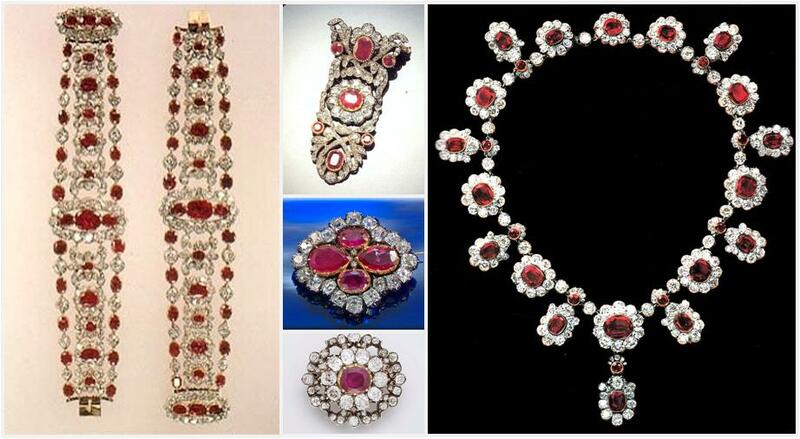 The set used nearly 400 rubies and more than 6,000 diamonds in all. The tiara and crown shown above are replicas of the originals made for Marie Louise; these are made of garnets and white sapphires and belong to Chaumet, the jewelry firm once known as Nitot. Click here to see more of the replica parure. Once he reclaimed the throne, Louis XVIII had the crown jewels redone in the Restoration style instead of the Empire style. In 1816, the ruby parure was remade to suit the Duchess of Angoulême by Pierre-Nicholas Menière. The design came from Menière's son-in-law, Evrard Bapst, and kept some of the features of the original Nitot parure. The new parure was just as extensive as the old, including both a larger tiara (shown in color above) of rubies set in scrolling diamond foliage and a smaller comb/tiara. Marie Thérèse came and went (after the abdication of Charles X, the Duke of Angoulême was king for about 20 minutes before he abdicated in favor of his nephew) and power in revolutionary France continued to change hands, but as state property the rubies managed to stay safe and sound in the treasury and were worn by Queen Marie-Amélie and Empress Eugénie after Marie Thérèse. They even remained in the design made for Marie Thérèse - Napoleon III and Eugénie had other pieces redesigned, but the rubies passed muster as they were. (Despite all this, I know of no representation of the tiara in use in its final form.) The parure was finally auctioned off along with much of the rest of the crown collection by the Third Republic in 1887. The different pieces belonging to the crown ruby parure went in different directions following the sale, and some have popped up in subsequent sales here and there. The two bracelets were donated to the Louvre and have been on display there since 1973, but the rest of the rubies (tiara included) are in private collections. 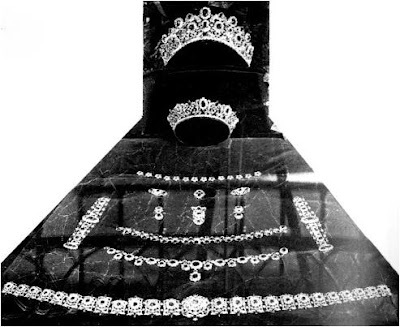 The tiara is said to be in the Niarchos collection. Some pieces may have been broken up; recently, a brooch made from part of the ruby belt came to auction. It would truly be a sight to see them all be assembled once again, but at this point that seems an impossible feat. Does this meet your criteria for a great ruby tiara? By the way...if you're thinking of a different tiara related to the Duchess of Angoulême...you should stay tuned.